YES, THERE ARE THINGS you can do to make Thanksgiving a stress-free and happy holiday. 1. Be thankful. Take time to pause to reflect on the big and small things in your life for which you are grateful. 2. Make a timeline so you can schedule your day and oven usage. 3. Read through all of your recipes to make sure you are clear about the order of instructions and the ingredients you'll need. 4. Check and make sure you have all the pots and pans you'll need. 5. Check and make sure you have all the plates, flatware, napery, serving utensils, glassware, and chairs you'll need. If you are short, ask a guest to pitch in. 6. Do as much as you can before BIG Thursday. Most purees can be made a week in advance and frozen. Make the pies, stuffing, etc. the day before. 7. Go easy on the table decor; avoid fancy and elaborate floral arrangements and knickknacks on your table. You'll have a lot of color with all the foods being served. With plates being passed around and serving utensils poking out here and there, you'll need more space than usual on your table. 8. Make use of extra hands in your house. The night before, rent a movie and put family members to work peeling butternut squash, green beans, or other time-consuming jobs that'll slow you down the next day. 9. The week before the holiday, make a list of all the ingredients you will need. 10. If you have a frozen turkey, be sure to begin defrosting it on Monday; in your fridge, a 14-pound turkey will take two to three days. If you forget, fill a large, clean cooler with cold water and put your bird in it, changing the water every other hour. If you are lucky (we told you to defrost your turkey earlier! ), your bird will be ready in eight hours. 11. Pick up a few extra bags of cranberries and pop them into the freezer; after the holidays, they'll be scarce. 12. It's the one day of the year to eat with no restraint. This is not the day for diets. Be full ... unbutton your pants if you have to. 13. Invite guests to your home and don't get hung up on the table being too crowded or things not being perfect. It's better to invite a neighbor, friend, or relative who would have been alone otherwise than to fret that someone is sitting in a folded metal chair or eating off a plate that doesn't match your pattern. 14. If a guest brings a surprise dish that doesn't go with your menu, serve it anyway. So much of Thanksgiving is about tradition and memories -- if Aunt Sarah needs to make chocolate cranberry turnip salad as part of her tradition, let it slide. 15. Thanksgiving is not the day to try out a new recipe. Stick with what you are comfortable with and what you know will work. 16. Instead of one GIANT turkey, consider two or three smaller ones. Everything will cook faster (consider cooking one the day before and one the day of, so that you can present one beautiful browned bird tableside), smaller birds will be more tender and juicy, and if you have a large crowd, you'll have more drumsticks. 17. Turkeys are notorious for being finicky to cook, because the white breast meat cooks more quickly than the darker meat of the drumsticks. There are several ways to even the playing field: Brine your turkey, butterfly your turkey, remove the legs and cook them separately, and/or cover the breast with foil (remove it the last 45 minutes to brown the skin). 18. To baste or not to baste? Basting does very little to add to the flavor of your turkey (not much of that flavor actually gets absorbed), BUT basting the breast does cool it down (by evaporation) and slows down the cooking time of the breast meat, which lets the legs catch up a little. 19. To stuff or not to stuff? Most food safety experts will tell you not to (some of the raw turkey juices could soak into the dressing and not fully cook). I prefer a stuffed turkey, but it will slow down the cook time. 20. At 325 degrees F/160 degrees C, most turkeys cook at about 15 minutes per pound (stuffed, about 20 minutes per pound). But keep your eye on things. According to food safety experts, your turkey is done when a meat thermometer reaches 180 degrees in the thigh, 170 in the breast, and 165 in the stuffing. Don't tell anyone I told you this, but I'd go 170 on the thigh and 160 on the breast. 21. Remember who is wagging this holiday's tail: If your turkey is done at 2:00, but you were planning to serve at 3:00, that is fine. Remove the turkey to its carving place and "tent" it with foil (don't wrap it in foil or it will steam and the skin will lose its crispness). It will stay warm. I promise. 22. Have a few simple jobs for guests to do (pour drinks, set water glasses, mind the ice bucket, make place cards with the kids, sit next to Grandma and make sure she has what she needs). 23. If you are a guest, be a good one. Don't stand in the middle of the kitchen and ask, "What can I do?" If you bring children, watch them and keep them entertained. If you bring an appetizer, make sure it is ready to go, not something that needs the oven or complicated assembly. Jump in and help with the cleanup. 24. Have extra ice. For some reason, you always need ice. 25. Buy disposable plastic food containers to send leftovers home with guests. My favorite part of the Thanksgiving meal is the turkey sandwich the next day. You can please some of the people all of the time and all of the people some of the time, and in an effort to please all the holiday guests all the time, present two to three wines to accompany the diverse foods offered on the holiday table. Bruce Sanderson of Wine Spectator says, "I like the versatility that turkey brings to wine selection. You can match both reds and whites, although reds tend to go better with the dark meat." Roasted turkey breast offers a subtle flavor that goes well with many wines. Food and wine pairing becomes more difficult when taking into account the many strong accompaniments. For example, full-flavored sausage stuffing, rich gravy, acidic cranberry sauce/salsa and the bold tastes of Brussels sprouts, pearl onions and sweet potatoes, all affect wine choice, just to name a few. Add to the diverse menu, the varied tastes of your guests: some prefer only white wine, others prefer only red, some like sweet wines while other guests will not indulge in any wines other than dry. Our recommendation for the holiday feast is to offer both a red and white and let your guests select the wine suited to their tastes. Gewurtztraminer - a fruity, slightly spicy wine that complements smoked turkey and other bold flavors. Chardonnay - many wine experts caution about serving rich oaky chardonnays. Select a crisp, lightly oaked chardonnay with herbal flavors. Riesling - a floral, fruity wine that appeals to sweet wine drinkers. Riesling is also suitable as an aperitif. Pinot Blanc - a very versatile dry white wine that pairs well with the diverse flavors of the Thanksgiving table. Sparkling wines - a wine that is always welcome and appropriate. Either non-vintage or vintage blanc de blanc is a perfect aperitif. Pinot Noir - the top choice for Thanksgiving wines, based on a survey by Wine Spectator. Some wine connoisseurs consider Pinot Noir the most food friendly of all reds. The light to medium bodied wine pairs well with the multitude of flavors and textures without overwhelming the turkey breast. Zinfandel - the truly American grape is a strong candidate to pour at the American holiday feast. The rich red wine will stand up to the strong flavors of the holiday dinner. Beaujolais Nouveau - the light fruity young wine is released in mid-November. Beaujolais Nouveau is made from Gamay grapes and is a friendly red that pairs well with the big flavors of the holiday feast. The Better Homes and Gardens Test Kitchen experts serve up answers to your toughest holiday cooking questions. What size bird should I buy? It depends on how many people you will be serving, and how big a bird your oven can hold. A larger turkey is more efficient at producing meat. For instance, turkeys weighing less than 12 pounds will serve 1 person for each pound of weight. A 10-pound bird will serve 10 people. 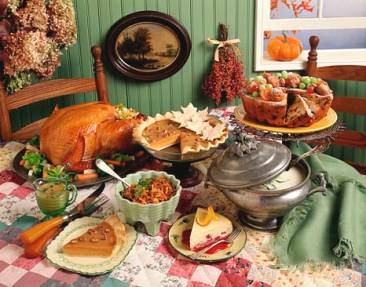 But a turkey weighing more than 12 pounds will feed 1 guest for each 3/4 pound of turkey weight. So, if you're having 20 guests, you'll only need a 15-pound bird. What's the best way to thaw a turkey? The easiest and safest way to thaw a turkey is to place the wrapped bird on a tray in the refrigerator. Plan about 24 hours for each 5 pounds of the bird's weight. Remember not to count the day you will be roasting it. Turkey should never be thawed at room temperature. I need my turkey today, and it's not completely thawed. What can I do? Place the plastic wrapped turkey, breast side down, in a sink of cold water. Change the water every 30 minutes. Once my turkey is completely thawed, how long can I keep it in the refrigerator? A thawed whole turkey will keep in the refrigerator for 1 to 2 days. How can I get a beautiful golden brown turkey without drying out the breast meat? Tent the turkey loosely with foil to delay browning of the breast. The foil should be removed during the last 30 to 45 minutes to allow the turkey to brown. Tenting for the entire roasting time can actually slow cooking. Do I need to baste a turkey while it's cooking? Our Test Kitchen doesn't feel that basting today's turkeys is necessary. More importantly, basting tools, such as brushes and bulb basters, could actually be sources of bacteria contamination if dipped into uncooked or undercooked poultry juices, then allowed to sit at room temperature and used later for basting. How do I know when my turkey is really done? Can I trust the pop-up timer? Temperature should be your guide to doneness. You can use the pop-up timer as an aid, but to assure that the turkey reaches a safe temperature, always use a thermometer. The thermometer should be inserted into the thickest portion but be sure it does not touch bone or the pan. Use either a meat thermometer, which can be inserted at the beginning of the cooking time, or an instant-read thermometer. Instant-read thermometers are not designed to stay in food during cooking. Pull the food out of the oven, then insert thermometer into the thickest portion of the inner thigh muscle. Wait about 15 seconds before reading. How can I be sure my thermometer is accurate? Submerge 2 inches of the thermometer stem in boiling water. It should read 212 degrees F. If the thermometer registers above or below 212 degrees F, add or subtract the same number of degrees from the temperature specified in the recipe and cook to that temperature. Why do recipes say to let a roasted turkey stand 15 to 20 minutes before carving? Standing time allows the natural juices to redistribute throughout the meat of the turkey. This helps to produce an evenly moist turkey that is easier to carve. Keep the turkey warm during the standing time by covering it with foil. How do I skim fat from pan drippings? Place the drippings in a measuring cup or similar container. Tip the container and use a metal spoon to remove the oily liquid (fat) that rises to the top. I've heard that roasting turkey in a paper grocery bag is really easy. Is it safe to roast a turkey this way? According to the United States Department of Agriculture Food Safety and Inspection Service, the glue and ink on brown bags are not intended for use as cooking materials and may give off harmful fumes. In addition, brown bags are usually made from recycled materials and are not sanitary. Can I roast a turkey overnight in an oven set at a low temperature? No. Roasting a turkey at a temperature below 325 degrees F allows harmful bacteria to multiply. These are the bacteria that can cause food poisoning and may be present on the raw turkey. Fortunately, they are easily destroyed with proper cooking techniques. Roasting the turkey at 325 degrees F kills the bacteria yet produces meat that is moist and tender. What's the best way to bring a turkey to a potluck? The best way is to roast the bird unstuffed; carve the meat off the carcass, cover and chill thoroughly. To reheat at the potluck, place sliced turkey in an oven-safe baking dish, add about 1/2 cup water, cover with foil, and heat in a 350 degree F/180 degree C oven about 30 to 45 minutes or until well-heated through. I have lots of turkey and stuffing left over. What do I do with it? Before carving your turkey, be sure to remove all stuffing. The leftover stuffing can be refrigerated for up to 2 days. After dinner remove all meat from the carcass (this should be done within 2 hours of the turkey's removal from oven). Leftover turkey can be refrigerated and used within 2 days, or frozen in small portions. Be sure to label and date the wrapped packages and use within 6 months. Leftover turkey can be used in any recipe calling for cooked chicken or turkey. Stuffing must be heated to at least 165 degrees F/73 degrees C.
How long can I keep leftover gravy? Leftover gravy should be kept no longer than 2 days. Always bring leftover gravy to a full boil before serving. Can I stuff the turkey the night before I roast it? Can I just make the stuffing and chill it? It is unsafe to stuff the turkey ahead of time. The chilled stuffing in the turkey will not reach a safe temperature before the turkey is done. To be safe the turkey should reach a temperature of 180 degrees F and the stuffing in the body cavity of the bird should reach 165 degrees F/73 degrees C. It's fine to make the crumbs or bread cubes ahead, but the stuffing should not be completely prepared ahead if it will be used to stuff a turkey. If the stuffing is to be baked in a casserole, it can be prepared in advance and chilled. The baking time will need to be increased by about 15 to 20 minutes. How much stuffing do I need to fill the turkey? Allow about 3/4 cup stuffing for each pound of ready-to-cook turkey. For example, a 12-pound bird will hold about 9 cups stuffing. If your family loves stuffing, you may want to make extra stuffing to bake in a casserole beside the turkey. My stuffing recipe calls for dry bread cubes; how do I make them? If I need 8 cups of dry bread cubes, how much bread should I use? You'll need 12 to 14 slices of bread for 8 cups of dry cubes. Why do recipes say to spoon the stuffing into turkey loosely? Stuffing will expand as it roasts. If stuffing is too tightly packed, it will not reach a safe temperature by the time the turkey is done. How do I get crumbled corn bread? Prepare a basic corn bread recipe or prepare a packaged corn muffin or corn bread mix according to package directions. Cool and crumble. You should be able to get about 5 cups from a 10 ounce prepared mix. My stuffing recipe calls for poultry seasoning and I'm out; what can I use? Use 3/4 teaspoon dried sage, crushed, and 1/4 teaspoon dried thyme, crushed, or dried marjoram, crushed, for each teaspoon of poultry seasoning used in the recipe. My pie recipe calls for pumpkin pie spice and I don't have any. What do I do? You can make your own pumpkin pie spice by combining 1/2 teaspoon ground cinnamon, 1/2 teaspoon ground ginger, 1/2 teaspoon ground nutmeg, 1/4 teaspoon allspice, 1/4 teaspoon ground mace, and 1/8 teaspoon ground cloves. Substitute this for 2 teaspoons pumpkin pie spice. Can I make my own apple pie spice? For each 1 teaspoon apple pie spice, substitute 1/2 teaspoon ground cinnamon, 1/4 teaspoon ground nutmeg, 1/8 teaspoon ground allspice, and a dash ground ginger. My pumpkin pie recipe calls for evaporated milk and I don't have any. You can substitute regular milk in the recipe, but the pie will not be quite as rich. My recipe calls for a 16-ounce can of pumpkin. I can only find a 15-ounce. Can I use it? Yes, the 15-ounce can of pumpkin will work fine in recipes calling for a 16-ounce can. I'd like to try to make my own pumpkin puree from a fresh pumpkin instead of using canned. What do I do? Cut a medium pumpkin (about 6 pounds) into 5-inch-square pieces. Remove the seeds and fibrous strings. Arrange the pieces in a single layer, skin side up, in a large, shallow baking pan. Cover with foil. Bake in a 375 degree F oven for 1 to 1-1/2 hours or untill tender. Scoop the pulp from the rind. Working with part of the pulp at a time, place pulp in a blender container or food processor bowl. Cover and blend or process untill smooth. Place the pumpkin in a cheesecloth-lined strainer, and press out any liquid. My recipe for sugared cranberries calls for raw egg whites. Is this safe? No. Raw or slightly cooked egg whites (or yolks) may harbor harmful bacteria. In place of raw egg whites, substitute pasteurized dried egg whites. They can be found in the baking section of many grocery stores or in specialty food stores. To get beautiful, evenly-coated cranberries, place each berry on a toothpick, brush with rehydrated dried egg white and sprinkle with sugar. Let dry on a cooling rack. Are there other places to find information on turkey roasting and other holiday food preparations? Reynolds Turkey Tips Line: 800-745-4000.